Use rotational symmetry to create multiple copies of an object. And, since the number of copies can be changed from one to infinity, you will end up with a multiplication model AND a model of a variable. Lay two plain rectangular mirrors on top of one another, face to face. Connect them at one edge with duct tape. You can usually find small mirrors in dollar stores and school supply or craft stores, and larger mirror tiles in home improvement stores. Put interesting things – like favorite toys or your face – inside the open mirror book. 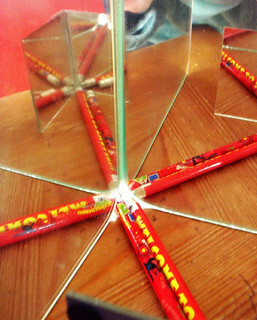 Change the angle between the mirrors and admire the greatest show in math! Fold a piece of paper through its center repeatedly, then sketch and cut out a snowflake. Real snowflakes always have 3, 6, or 12 sides, but abstract mathematical snowflakes can have any number, even 5 or 7, if you are clever about folding them. 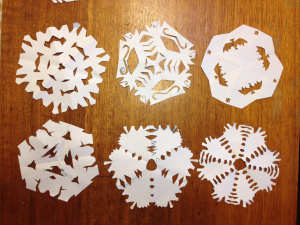 Learn different folds and make a snowflake multiplication table! What multiplication ideas do you see in this topic? How about ideas inspired by algebra? Did you use this with kids or students? How did it go? What did they say and do? What questions did they ask? Children are immediately intrigued by mirror books. Let kids explore the books first. Younger children might bring favorite toys and pile them between the mirrors. Older children or those with more experience with the mirror book will build elaborate designs, act out stories, write coded messages and create puzzles. Young children might need help with folding paper and cutting the designs. You can minimize frustration by asking the child to draw the design on a folded snowflake for you to cut out. It works especially well if you make a giant snowflake. Some children might not want to cut any designs at first. Instead, they might prefer to fold, then make one or two straight cuts. Go for it! It’s a perfect opportunity to admire how even very simple steps, repeated enough times and mirrored, can create complex patterns. Make giant snowflakes out of newspapers or wrapping paper, for easier cutting. Your toddler can guide your hand with scissors, or you can wrap your hand around your child’s hand to help. Find full-body mirrors at an angle in dressing rooms, or make your own giant mirror books out of large door mirrors, using any door and its adjacent wall. Combine two mirror books and let the kids explore infinity. If playing with paper, fold the paper once, cut or punch out a small circle, and ask the child to predict how many circles will there be once you unfold the snowflake. What if you fold the paper twice? Three times? Four times? Draw or write numbers, letters and words inside the mirror book, or cut them out of snowflakes. How many symmetries, hidden in these shapes and symbols, can your kids discover? Become a puzzle maker. With a mirror book, ask if it is possible to make a square (or any other shape) with one toothpick. Or challenge the child to turn a slice of pizza into a whole pizza. How can we have our (whole) cake and eat it too? Fold paper for the snowflake and ask your child to cut it in such a way that when unfolded, there would be only one circle. Invite the child to create new puzzles! Model radial symmetry in software, such as GeoGebra or Scratch. Rotational symmetry connects counting and grouping, visual and sequential, algebra and geometry. That’s how the nature multiplies the same pattern (by the same genetic code) across all arms of an octopus, or all petals of a flower. You can add objects inside the mirror book, or cut to the folded snowflake, one by one. The reflections multiply that group you create into all the copies, all at once. 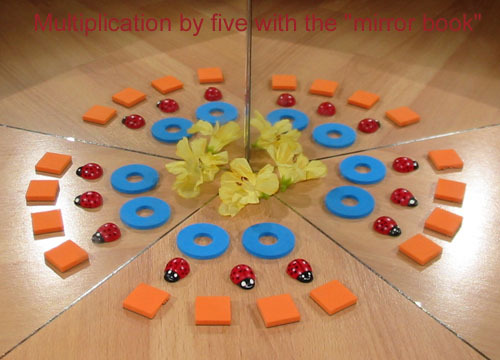 The mirror book has two variables: the number of objects and the number of reflections. But you can take a more continuous stance, if only you take the angle between mirrors as your variable. With some angles, you can have fractional reflections! With snowflakes, the number of sectors and the number of cuts are the two variables. But cuts on edges or the middle don’t get multiplied by the full number of folds, so the system is more complex than just multiplying cuts by sectors. I showed a mirror book to my child and tried to explain what to do. He didn’t seem interested. Then he dumped a pile of small toys into it, looked for exactly one second and ran away. What did I do wrong? If at all possible, we encourage you to make all your math manipulatives, including a mirror book, together with your child. There is a lot of hands-on mathematics in the process of making things. Besides, children are more eager to play with the toys they made themselves or helped making. There are, of course, situations when making a math toy with a child is not possible or practical. In this case, make sure to give your child plenty of time to free play with the toy. Do not try to provide any directions, explanations, or rules at this point. 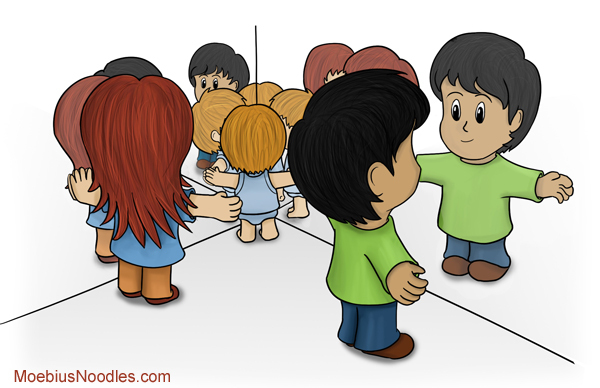 Leave the mirror book (or any other math play object) where a child can easily see and use it. Children will come back to this activity, if only for a few seconds. Observe and record (if possible) their play and its results. You will soon notice how their play, however short, becomes more complex and purposeful. Finally, next time your child has a playdate, let children play with the mirror book. You will be amazed at the complexity of designs and the depth of discussions that accompany this activity. Radial and reflection symmetry are beautiful! It is easy to find, but not that easy to capture. Look for examples of it in nature (hint: near bodies of water on a calm day), architecture (all that glass and polished highly reflective surfaces), and at home. See how many multiplication facts you can find or create. Attachments: Up to 4 attachments (including images) can be used with a maximum of 524.3 kB each and 1.0 MB total. FYI The dance company Momix presents mirror books through dance in their show Alchemia. This too does not give it justice - they use the mirrors to give the appearance of a constantly changing number of dancers. mirror books, fascinating to everyone! She particularly enjoyed making polygons with a toothpick. I took your advice and had the kids construct their own mirror books. I had 2 groups of 2, each working with an adult. This was great advice, because the kids started making discoveries during the construction process - the found a way to hold the mirrors (pre-tape) that gave them a seeming infinite number of reflections. Once taped, the kids came up with their own ideas and experiments. They also worked on the toothpick challenge and the pizza slice challenge. They put 3 mirror books back to back and made different "rooms." They experimented with the effect of changing the angle size. They spent the last half hour of the 2-hour session doing this, then some kids stayed late and kept doing it at lunch time, and then after the friends left, my daughter kept doing it all day, and called her dad at work to tell him about them. We still have them up on our table for continued play. BTW we got a box of 6 12" mirror squares at Lowe's for $9.95. Definitely this is among the best $10 ever spent in our house! when built atop a mirror. Her knob-less cylinder towers do the same when built on top of a mirror. A tangram here; 7 x 4. @sherylmorris - when you combine mirrors with other well-organized materials, such beauty happens. The Montessori beads, these glass cubes, wow!!! Boy, was this a hit! I had the kids help me make two mirror books in the morning and then in the afternoon I set them up on the table. I put a salt shaker in front of one and a pencil in front of another. My 15yod immediately gathered all the other pencils she could find a made a tree fractal in front of the mirror. My 11yod spent a while noticing what weird things happened to her own reflection as she moved side to side in front the mirror book, or got closer or farther away, or changed the angle of the mirrors. After a while my 13yos came over and set some chess pieces up in front one of the books, then closed it as far as it would go. It was too dark to see inside so he got the flashlight out and laid it on the table behind the chess man, shining into the book. They spent well over an hour playing with the mirrors, making the two books into a box, adding a floor and ceiling with the two spare tiles... During supper they told their daddy and older siblings about it, then set it all up again to show them. The mathematical ideas they talked about mostly had to do with infinity, especially when the two books were set up to face each other, forming a box. My 11yod set her teacup into the middle of the box, and when you looked over the top of the box, you could see the teacups on a road going on forever. The "road" the teacups were on seemed to curve uphill, then crest and continue downhill and off to the left. It seems that the left-ward curve was caused by the not-quite-squareness of the box, and the "hill" was caused by the mirrors being not perfectly perpendicular. I definitely need to come back to this again. @MerrilySpinning - that first picture is so mysterious! I used to keep mirror books out on a low table, with some "beautiful stuff" (figurines, beads, natural materials). They get played with a whole lot. I wish we had some mirrors for that project because it does look very fun! We did the snowflakes though, and I know from trying at least once each winter to make snowflakes, that my son isn't a big fan. So I changed it a bit. We made a game out of it and folded the paper up, and then put holes in it, and tried to figure out how many holes would be there when we unfolded it. At first he tried to multiply by the number of folds, but found out that wouldn't work. He did see the link to the previous task where we cut the paper in half repeatedly, when we slowely folded it and counted the holes that would appear with each fold. He really enjoyed it, and we got extra multiplication practice in at the end when we were counting all those holes up. I did find this hard to get exactly right from the teacher perspective, it seemed it was always just a little too easy, or a little too hard (we started adding in strange folds in at the end), so a couple times I didn't even know the answer and so we found out together if he was right or wrong. Either way, he loved it, and never felt discouraged, and only stopped because we ran out of paper. Here are a few of the "snowflakes". Just tried this with my 4.5 yr old. Fold paper in half, punch one, two, three holes and guess how many there will be. Fold paper in thirds, in fourths, in sixths, in eights. We punched one hole for these types of folds. She couldn't quite predict how many holes. But if we play a bunch I bet she will be able to. Very engaging. Great idea. I'm glad it worked well! I noticed that at first, my son too had trouble, so we folded it slowly together and he added as we folded (before we even punched a hole) and that seemed to help him. It was a surprisingly enjoyable exercise! We have three mirror books, and they are favorites of guests from age 2-8. Yesterday my 4.5 yr old used the mirror book to turn her tangram triangles into squares in three different ways. We got inspired by some googling radial symmetry in nature. 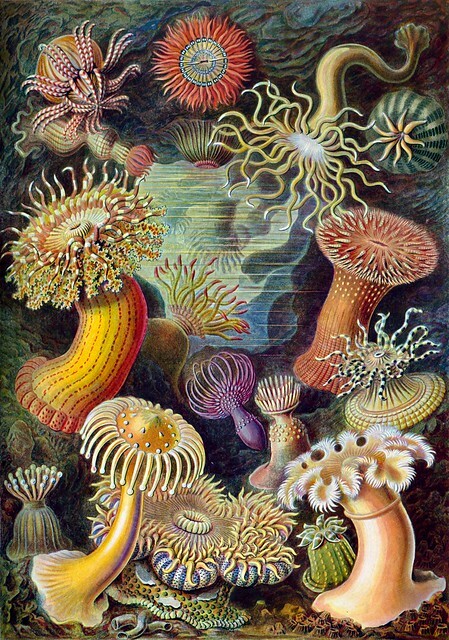 The whole thing was reminding me of mandalas. And I even found a mandala generator http://www.colormandala.com/ . We played with an online symmetry artist program http://www.mathsisfun.com/geometry/symmetry-artist.html which was hilarious. You draw in the top box & it copies you in the bottom box. My son loved that we found a radial symmetry generator on Scratch too http://scratch.mit.edu/projects/13000423/ . And we had lots of fun playing with the mirrors. We only had one tiny mirror but my bathroom as 3 mirrors slightly angled so we had fun with that and putting the little mirror at various angles to the big mirror. She had lots of fun putting dolls into a mirror book, and also using her fingers to create a huge finger forest. My kids had fun with this one! and here we have a teepee created by my 5yo son, with a hex bug added by my 8yo son. It's almost a nonahexbug.